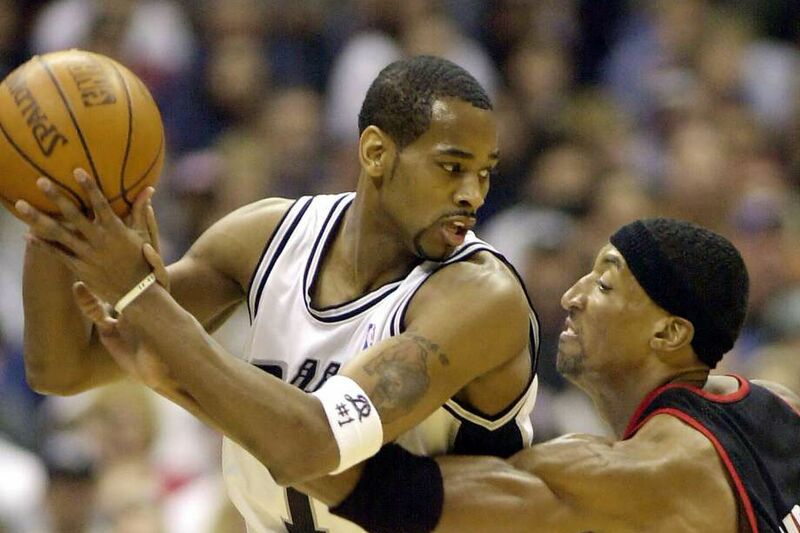 These are the most memorable one-and-done Spurs from the early Pop years. Often times when you think of players who only lasted one season with the San Antonio Spurs, it’s usually because they were fringe, third-string players who were space-fillers on minimum deals. They rarely leave a lasting impression and are usually soon forgotten. However, there are exceptions. Sometimes all it takes is one year for a player to engrave himself in Spurs lore for one reason or another, be it on-court production, likability, or any other reason. Over the last couple of seasons alone there have been a few highly beloved Spurs that only stayed in San Antonio for one season but will be fondly remembered for much longer, and that got me to thinking: who are the most memorable one-and-done players of the Gregg Popovich era? This is part one of a two-part series, with this list focusing mainly on the first half of Pop’s tenure. The only rule is the player could only spend one calendar season with the Spurs, so one partial and one whole season eliminates players like Nazr Mohammed from consideration. Without further ado, here is the list in chronological order. Anderson is a bit of a controversial figure in Spurs history. He is by far the best player that will appear on this list, averaging 15.5 points, 4.4 rebounds, 3.7 assists, and 1.5 steals in his lone season in silver and black. He was the Spurs’ third best player that season by a landslide (some might argue he should be second ahead of David Robinson, although his efficiency numbers left something to desired), and it seemed like he might be the Spurs’ answer to the growing dynasty of the Shaq/Kobe-led Lakers. Unfortunately, Anderson never got far enough to find out after a dirty karate-chop from Juwan Howard dislocated his shoulder and ended his season in the second round against the Dallas Mavericks. The Spurs would go on to get swept by the Lakers in the Western Conference Finals. If the Spurs hadn’t won the championship in 2003, Claxton likely wouldn’t be on this list. He was traded to the Spurs from Philadelphia in the summer of 2002 and only appeared in 30 regular season games, posting serviceable numbers of 5.8 points and 2.5 assists while backing up Tony Parker and, at times, Steve Kerr. What keeps Claxton in the hearts and minds of Spurs fans is his performance in the playoffs, most notably the Game 6 of the NBA Finals. With a young Parker struggling to produce, Claxton was the floor general for the Spurs’ game-deciding 19-0 run that ultimately won them their second championship. While Stephen Jackson is usually the player mostly associated with the infamous run (and for good reason), Claxton himself hit a couple of huge shots at defining moments. You might be wondering how a player who only appeared in 12 games for the Spurs and averaged less than a point and rebound per game can make this list. The answer is simple. Not only was Bateer popular enough among Spurs fan to garner loud cheers the few times he entered the court, but his presence also represented some history. In 2003 the Spurs were just beginning there conquest for international players, beginning with Parker and Ginobili. Pop, an assistant coach for Team USA at the time, had seen Bateer perform for China and decided to take a chance on him. While not much came from the signing, Bateer was still the first and is one of only two Chinese players to win an NBA championship. Another player who signified the Spurs movement towards international players, the Turkish forward was an important piece on a Spurs team that may have repeated if not for some rotten luck. After garnering some Sixth Man of the Year votes with the Sacramento Kings, Turkoglu was traded to the Spurs, where he improved even more with averages of 9.2 points, 4.8 rebound, 1.9 assists and a career high 41.9 percent from three while starting in just over half of the games. While it was just a one-season fling and he would go on to post bigger numbers elsewhere (including for the Orlando Magic during their contending days with Dwight Howard), in a way Turkoglu represents a trend that to this day is still popular among players seeking to prove themselves: go to the Spurs, improve and impress under Pop, then go make your get money. That’s it for Part 1. Part 2 will come out soon. If you have any other one-and-done players from the early Pop years you think should be on this list, feel free to give them a shout-out in the comments!